Telesat will use Google's network operating system. Will Google get access to data? A global backbone? Telesat is making progress. Within the last month, they announced a launch contract with Blue Origin, a successful antenna test with Ball Aerospace and completion of system requirements reviews, but perhaps more interesting is an agreement to use the software defined network (SDN) platform Google has developed for their Project Loon. Loon balloons float at an altitude of around 20 km, above birds and the weather. They navigate by moving up or down to catch wind currents moving in different directions.Google has been interested in connectivity for underserved areas for many years, and have investigated and invested in non-terrestrial solutions using satellites, blimps, drones and balloons. 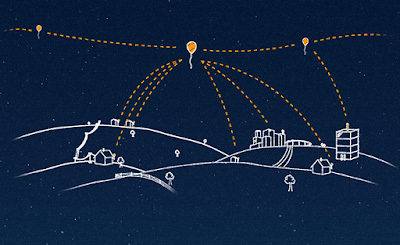 Project Loon uses constellations of balloons in the stratosphere. They began working on it in 2011, provided emergency connectivity in Peru in 2016 and Puerto Rico in 2017 and are slated to begin commercial deployment in Kenya later this year. Like LEO satellites, Loon balloons are in constant motion relative to the Earth and each other and the Loon SDN "schedules, predicts, controls and optimizes the wireless topology, radio resources, and routing of packets across the ground and aerospace segments of non-geostationary networks." The satellites and balloons are at different altitudes and move at different speeds, but the network characteristics are similar and Google will adapt their SDN for Telesat's satellite constellation. Nothing was said about the terms of the deal. Since Google is also an investor in SpaceX, they now have an interest in two of the three large LEO satellite Internet-service projects. In addition to being paid to develop and maintain Telesat's SDN and getting a return on their SpaceX investment, they might be getting access to the data flowing through the networks or to a global backbone. Softbank invested a billion dollars in OneWeb's satellite-Internet project for access to data. Softbank founder and CEO Masayoshi Son outlined his vision of the future in the keynote session of the 2017 SoftBank World conference. He believes the information revolution will be driven by strong, general artificial intelligence (AI), therefore the key material asset for the information age will be AI training data. His conclusion is "whoever gets the most data wins." Google uses data for AI training and for advertising. Another intriguing possibility is that Google and Telesat might be planning to integrate their balloon and satellite networks. One can imagine Project Loon using Telesat's satellite network as a global backbone. That integration would be facilitated by their both running the same SDN software — the same network operating system. Whatever the motivation, this partnership provides Telesat with a strategic software asset and Google may gain access to data and a fast, global backbone. For progress reports on the three LEO broadband projects, see OneWeb, Telesat and SpaceX. Local Time: Tuesday, April 23, 2019 07:07 AM PDT – Page Load: 0.2800 Sec.